The first wind turbine project in the country to be built on U.S. Forest Service land will break ground Monday in southern Vermont. 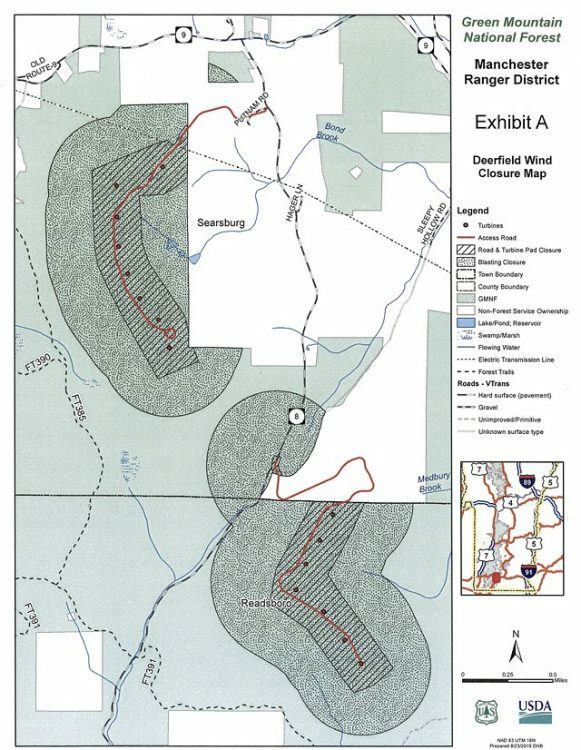 The 15-turbine project spans across parts of Readsboro and Searsburg, just north of the state border with Massachusetts, within the Green Mountain National Forest. Construction comes after the developer Avangrid – formerly called Iberdrola – cleared a controversial permitting process that took more than a decade. The developer has an agreement with Green Mountain Power to purchase 30 megawatts of power for 4.8 cents per kilowatt from the project once it is constructed. Gov. Peter Shumlin and local officials are scheduled to attend the project’s 11 a.m. groundbreaking ceremony in Readsboro on Monday. Officials said the Bennington County site is on private property and open to the media and by invitation only. Annette Smith, the executive director of Vermonters for a Clean Environment who has long fought the project, plans to attend the event without an invite. “A number of us will be there. They might want to hold their little ceremony on private property and restrict the public, but this is a project on public lands and the public will be present,” she said. Smith’s organization sued in an unsuccessful attempt to halt the project. She said the effort cost more than $125,000. Among her many environmental concerns about the project is erecting the turbines in a national forest. “It sets a precedent that opens up all wilderness areas to being surrounded by big wind turbines,” she said. Ben Walsh, a public policy advocate for the Vermont Public Interest Research Group, said he wasn’t invited to the groundbreaking either – but he welcomes the project. The U.S. Forest Service will close a portion of the forest where road and turbine construction will take place. The map above shows two areas that will be off-limits to the public during construction.